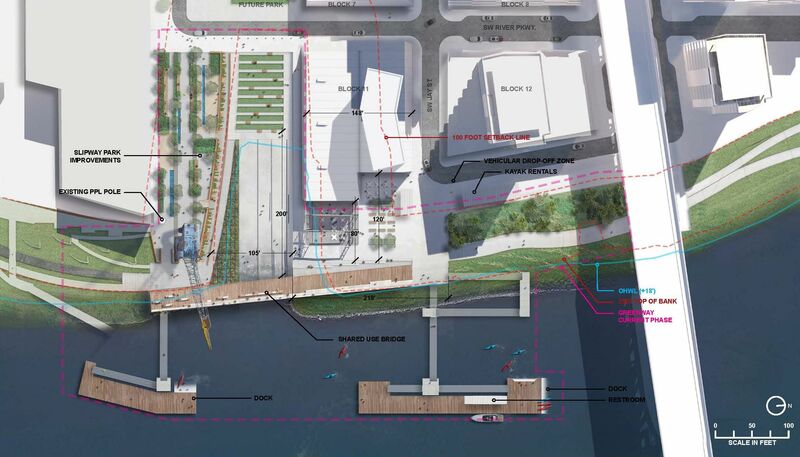 Plan view of the planned improvements at the Zidell Slipway, designed by PLACE landscape architects. The conceptual designs were presented to the Design Commission in December, but are now on hold. The Oregonian reported that the Zidell family have suspended plans for development on the Zidell Yards in South Waterfront. The Portland Tribune reported that “as the scale of the plan had increased, so the city’s willingness to split the cost of infrastructure had waned.” Portland Architecture wrote about the film ‘Built by Zidell’, which covers the family’s legacy on the site from 1928 to 2017, when the company launched its last barge. The Portland Business Journal took a look at Simple’s Central Eastside campus, which now includes Clay Creative and 120 Clay. According to the Portland Mercury Good Coffee Company has opened its third location in Slabtown’s Leland James Building. The Portland Business Journal published photos of the 9North office building, originally known as Station Place Lot 5, currently taking shape in the Pearl. Every week, the Bureau of Development Services publishes lists of Early Assistance applications, Land Use Reviews and Building Permits processed in the previous week. We publish the highlights. This post covers January 8th to January 14th, 2018. 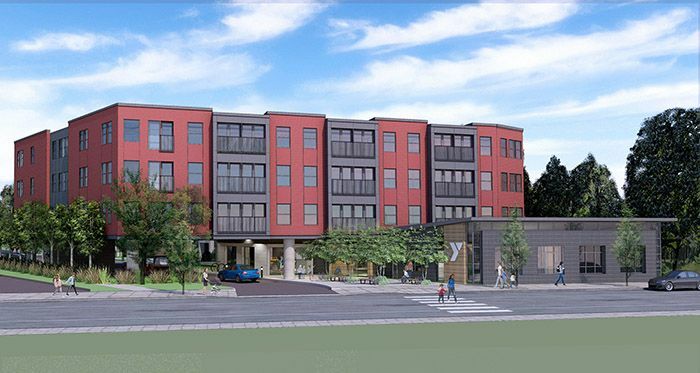 Current Code: Construction of a new 4 story (6,755 square foot) mixed-use building. Five dwelling units on levels 2,3 and 4 are proposed with retail space on the ground floor. This is a contributing site in Alphabet Historic District. Future code: The proposed project is a new + 18,559 sf 3-story addition to an existing 7,660 sf 1-story building on NE Alberta and 30th Ave. Both frontages appear to be improved. The proposed primary use is mixed use retail and restaurant on the ground flor and household living on the 2nd-4th floors (19 units). The existing ground floor building will be reuised as-is (with appropriate seismic and other upgrades). Current code: Construction of new three story wood framed construction over 1 story mass timber mixed use building with the ground floor having 2 retail spaces and 9 tuck under parking stalls. There are 36 residential units with varying sizes. 8 of the residences will be affordable housing units. Two stairs access each floor, with one extending to the roof via roof hatch. Site will have below grade drywell connected to storm and 1 flow through planter to north. 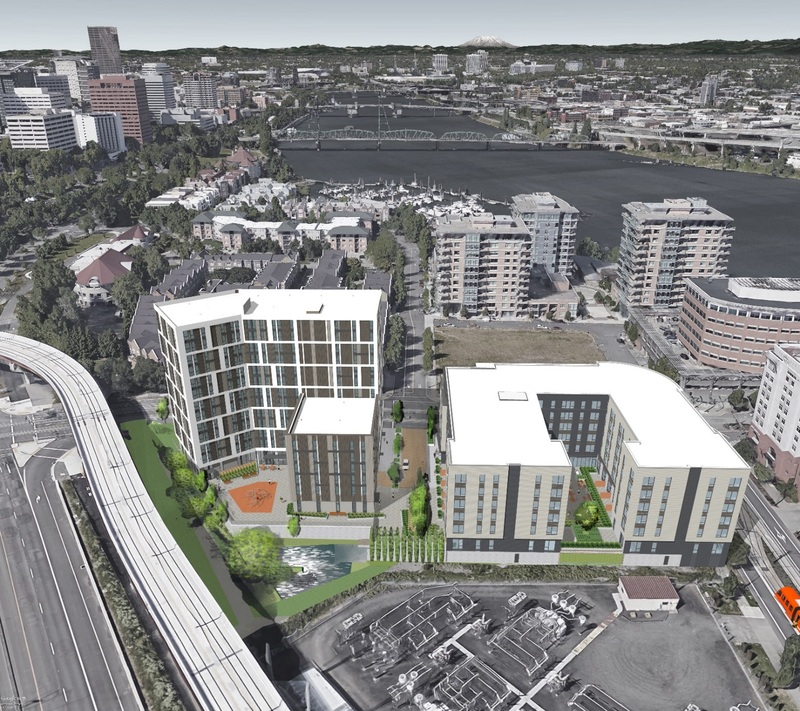 Current code – The University of Portland will be submitting an application for Greenway Review for proposed development on the University’s River Campus. New code doesn’t affect this site: Tenant improvement for new boulering gym. No proposed changes to the exterior of the shell, no proposed changes to impervious areas. This would be for a change of use – Type III Conditional Use land use review. Current Code: Proposed project will be a phased mixed use development containing two high rise residential towers and two levels of below-grade parking for a total area of approx. 798,000 SF. Each of the towers will include 250-300 units of multi-family housing subject to inclusionary housing requirements. Planned expansion to existing skilled nursing facility as part of the CUMP in 2011 (11-139546 CUMS AD) for the site. The proposed expansion will increase the existing 38,342 square foot skilled nursing facility with an approximate 8,500 square foot building addition, providiing 18 more beds to the facility. Proposal is for Providence Park retail and Ticket Booth Addition. An addition of 1,300 SF of retail store in existing plaza area at corner of SW 20th and SW Morrison Streets and reconstruction of existing ticket windows to combine three locations into one 160 SF location.